Bootsy Bursk, left shares coffee and conversation with officers Shawn Kelley and Tim Bell of the Hillsboro Police Department during Wednesday morning’s Coffee with a Cop event at Momma’s West Main Cafe. A national initiative this week offered local residents an opportunity for casual conversation with members of the Hillsboro Police Department during Wednesday morning’s Coffee with a Cop event. The initiative, now in its third year, has the objective of bridging the gap between the community and the law. In Hillsboro, the gap was bridged at Momma’s West Main Cafe, where locals mingled with police for a few hours over a hot cup of coffee. Police Chief Darrin Goudy told The Times-Gazette that Coffee with a Cop gives citizens a chance to the sit down with a police officer and not only get better acquainted with them, but also share any problems or concerns regarding the community they call home. Goudy said the annual event is right in line with the core principals that he and his fellow officers share: to serve and protect. He and Sergeant Shawn Kelley both had praise for the event, saying they thought it was a great way to serve the community. Local residents got to know Bell and Kelley at Coffee with a Cop, and likely learned that both men were focused on careers in law enforcement from a young age. Kelley’s interest in law enforcement began while he was in college studying mechanical engineering. In a story reminiscent of the old NBC-TV series “Adam-12,” where a younger officer is teamed up with a seasoned veteran for road patrol, Kelley’s first partner when he joined the force in 2003 was Bell. The 1984 graduate of Hillsboro High School began his career at the age of 21 at the Highland County Sherriff’s Office before joining the HPD a year later. The beat he walks now is the hallways of the Hillsboro City Schools as the district’s resource officer. For both officers, the career choice they committed to years ago is rewarding and fulfilling. Kelley shared several instances where he was in a drive-thru getting coffee or grabbing a burger and fries while working late, then discovering that his food had been paid for by the people in the car in front of him. For Kelley, chasing criminals is a daily task — and while sharing a cup of coffee with a neighbor at Momma’s doesn’t happen as often, it’s all part of the job. 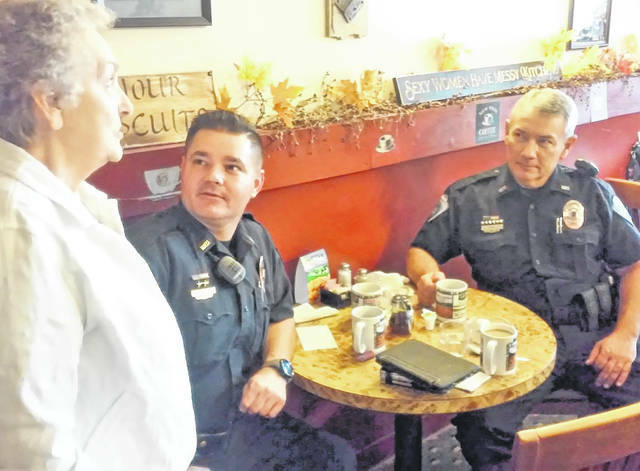 https://www.timesgazette.com/wp-content/uploads/sites/33/2018/10/web1_Coffee-With-Cop.jpgBootsy Bursk, left shares coffee and conversation with officers Shawn Kelley and Tim Bell of the Hillsboro Police Department during Wednesday morning’s Coffee with a Cop event at Momma’s West Main Cafe.